The infants in child care are cared for in specially designed nurseries and are provided with the personal attention, security, stimulation and nurturing they need. Both indoor and outdoor activities are planned each day to teach gross and fine motor skills. Parents are provided daily reports, both written and verbal, on their child’s day, including what their child ate, diaper changing schedule and new developments. Our outdoor playground is also equipped with Perma Grass, which allows the infants to crawl around on a soft surface without the potential of placing small mulch pieces in their mouth. Our Toddler Program provides many opportunities for the children to express themselves and their newly found power of mobility. Each week, our staff encourages creativity through hands-on activities associated with our “Theme of the Week.” All activities are designed to further your toddler’s language and gross and fine motor skills. We emphasize all skills that are necessary to thrive in the world around us. Our outdoor play area is age-appropriate and is shaded to ensure the comfort of our children during playtime. Our Preschool program provides a stimulating environment that is both creative and energetic. Our theme of the week curriculum provided daily activities that are full of adventure and excitement. Our preschoolers are introduced to math and language concepts, as well as, participate in hands-on science projects. Classes are designed with learning centers for individual and group projects. 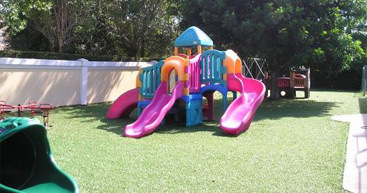 Our Preschool playgrounds are also equipped with Perma Grass and plenty of shade to ensure the comfort and coolness of the children while they enjoy outdoor play. Summer is just around the corner and it’s “Fun in the Sun” here at PDS. Summer camp starts in June for children ages 5-11. Your child will be engaged through a weekly program, arts & crafts, field trips and in-house activities. Breakfast, lunch, and snack are included! (Children must wear summer tee-shirts daily).